Pacific tropical cyclones (typhoons) pose a significant risk to communities, economies, and ecosystems in the Pacific basin and surrounding coastlines. In spite of their destructive power cyclones play a vital role in the global hydrologic cycle and in regulating ocean temperatures and atmospheric circulation. 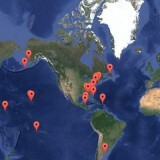 As in the Atlantic basin the information about past tropical cyclone activity is scant. The instrumental record in the Pacific only extends back to the mid-20th century, the high-resolution satellite observations comprise only the most recent few decades of that record, and while direct human observations have been noted for centuries such records are both incomplete and potentially inaccurate. The observational/historic record does not permit the identification and characterization of climate modes that may influence storm activity on centennial and longer timescales, including climate conditions for which there are not analogous historic observations. With such a limited view of cyclone activity our ability to assess the effects of such storms on human and environmental systems is greatly impaired. Understanding the spatial patterns of typhoon activity, the rates of reoccurrence and the mechanisms that contribute to storm development, intensity, and a storm’s track is essential to better preparing Pacific coastal populations for future events. 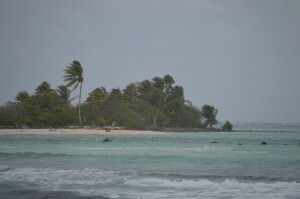 Many Pacific island nations are seeing local sea levels rising at rates in excess of 2mm per year (or 20cm per century) and these rates are expected to increase. Rising sea levels mean that land which was once safe from storm-induced flooding is now susceptible to inundation. Our research objectives are to identify the relationships between variable climate conditions (such as ENSO) and how those drive storm genesis, intensity, and storm track. To accomplish this with any certainty the observational record is insufficient, being largely restricted to storms that made landfall near human settlements and for which witnesses lived to tell. However, through careful analysis of coarse-grained storm-induced deposits contained in key sedimentary archives and numerical modelling we can reconstruct tropical cyclone activity for much of the Pacific Ocean and coastal zones going back millennia. Pacific reefs are pockmarked with deep protected basins. Atolls may circle relatively shallow lagoons. Just as in the Atlantic, though with greater scarcity, back barrier lagoons and marshes can be found on certain Pacific islands and coasts. 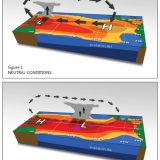 These environments act as recorders of tropical cyclone activity. As a storm moves near such a feature (or makes a direct strike) coarse material from the reef platform may be picked up by the waves and deposited into these protected lagoons or basins. After the storm has passed, normal sedimentation resumes and over time the coarse overwash deposits become buried under a layer of finer sediments. 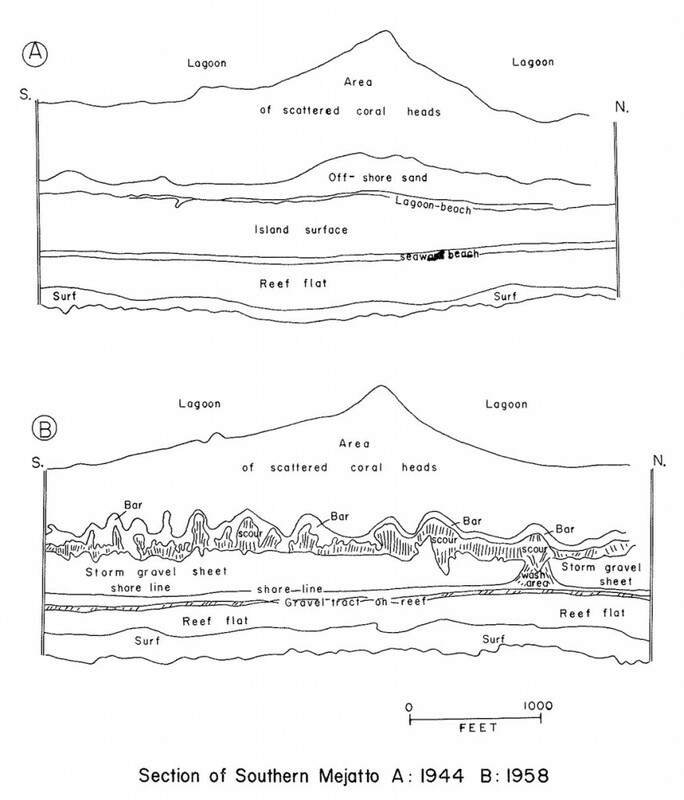 In regions where carboniferous rocks (karst) characterizes most of the geology the composition of the finer sediments and coarse material is the same, it is the grain size alone that distinguishes the event beds. This is contrast to the North Eastern US coastal ponds that are often dominated by organic muds and fine silts and clays, with storm deposits consisting of visually distinct siliciclastic beach sands and cobbles. Geochemical analysis can be used to identify transitions between marine and terrestrial input. An increase in strontium indicates marine input while titanium is indicative of terrestrial run-off. The geochemical approach helps to identify when a fresh water basin was breached, or when heavy rains may have washed terrestrial cobbles into a coastal repository. By combining the geochemical and grain size analyses storm layers can be identified. Dating the events can be done through a combination of Pb210 and Cs137 detection for sediments less than ~150 years old. Carbon 14 dating and continuous flow AMS can be used for older (deeper) intervals. Observations made on Jaluit Atoll following hurricane Ophelia in 1958 were the first to scientifically record the destructive potential of these storms in the Pacific and note the potential for lagoons as typhoon recorders. Yet, in the near 60 years since centennial to millennial scale typhoon reconstructions from the western North Pacific are currently few. Woodruff et al. (2009) reconstructed extreme marine flooding events from two neighboring coastal lakes in southern Japan over the last 6400 years. The results indicated an inverse correlation between the frequencies of intense storms forming in the western North Atlantic with those in the western North Pacific, and linked both to ENSO variability with fewer storms impacting southern Japan during La Nina years while there was a marked increase during El Nino. This work also noted that the South China Sea experiences an increase in storm activity during La Nina and a decrease with El Nino. Figure 1 – Maps of the Pacific showing average precipitation from 1979-2009 in mm/day (Global Precipitation Climatology Project (GPCP); Adler et al., 2003). Maximum precipitation values in the northern hemisphere are the intertropical convergence zone (ITCZ). North Pacific tropical cyclone tracks since 1945 are shown with black representing La Niña cyclones and white representing El Niño cyclones. Past and proposed study sites are shown. Left diagram: all intensities, right diagram: Cat. 4 and 5 intensity events only. Recent reconstructions developed by cores collected from Ta’haa French Polynesia in the South Pacific show both active and inactive cyclone intervals. These intervals appear to be in-phase with the active intervals from the North Atlantic and out-of-phase with North Pacific. 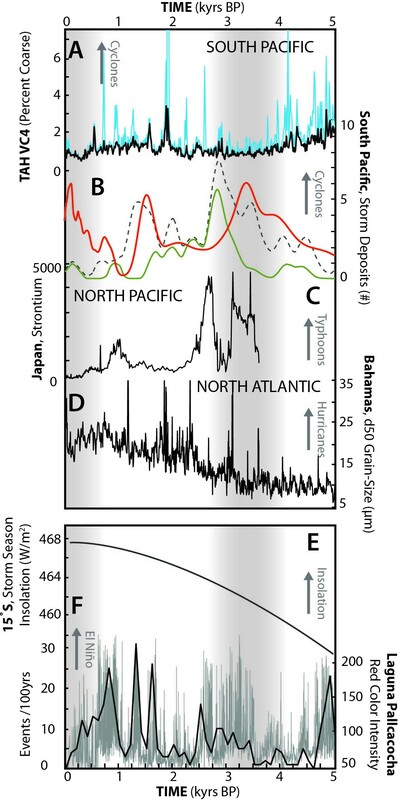 These reconstructions tell us that throughout pre-history the Pacific has experienced periods of increased and decreased cyclone activity with such intervals potentially lasting thousands of years, and also offer insight into the correlation between ENSO and cyclone activity. More reconstructions are needed from elsewhere in the basin in order to better address Pacific-wide pre-historic storminess. By combining these results with sea-level reconstructions and analysis of Pacific landform evolution we can begin to understand the destructive power and environmental importance of these storms while preparing ourselves for an uncertain future. Comparison of tropical cyclone records from Tahaa, the North Pacific and North Atlantic with records of hypothesized climate forcings. (Top) Tropical cyclone reconstructions from Tahaa (A) Percent >250 μm (light blue) and 63–250 μm (black) for TAH VC4 (B) Coral conglomerate and reef blocks from the Society Islands (black line) and the entire Central South Pacific (dashed line). Record of tropical cyclone deposited beach ridges from Northeastern Australia (orange) (C) Japan , and (D) Bahamas. (E) Storm season (NDJF) incoming solar insolation at 15° S. (F) Inferred changes in Holocene El Niño frequency based on red-color intensity in sediments from Laguna Pallcacocha, Ecuador.